The Talking Box: Giveaway: Cupcake Plunger! It's been a bit since we had our last giveaway, but hopefully this one will spark some interest! With Cake Boss: Next Great Baker being all the rage (and one of the more popular topics on this blog - take a look to the left and see how many of the current "what people are reading" articles are related to the show!) and ending soon, I wanted to give away something baking-related. 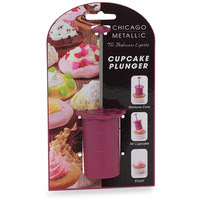 And, this cupcake plunger is the lucky item that you could win! While I'll admit it's not my favorite way to fill a cupcake, it's a pretty easy kitchen gadget to use. The basic idea is that you put it over the center of a cupcake (already baked), plunge down the trigger to your preferred depth (there are two suggested lines pre-marked), twist out and remove the middle, and push down on the plunger to extract the cupcake. You can then fill and frost, or trim the removed section and add it back on, or create your own way to enjoy your pastry. There are a few YouTube videos with suggested methods as well, so you've got plenty of options! Good luck, and if you have any questions, feel free to ask! I would like to see Ryan Cimorelli from Rhode Island win on the Next Great Baker on TLC. I think Marissa should win, I loved the cake for Miss USA!